Friday afternoon we visited the Parthenon in Nashville. It was originally built as part of the Centennial Exposition in 1897 (out of plaster), and was then re-built out of sturdier materials. 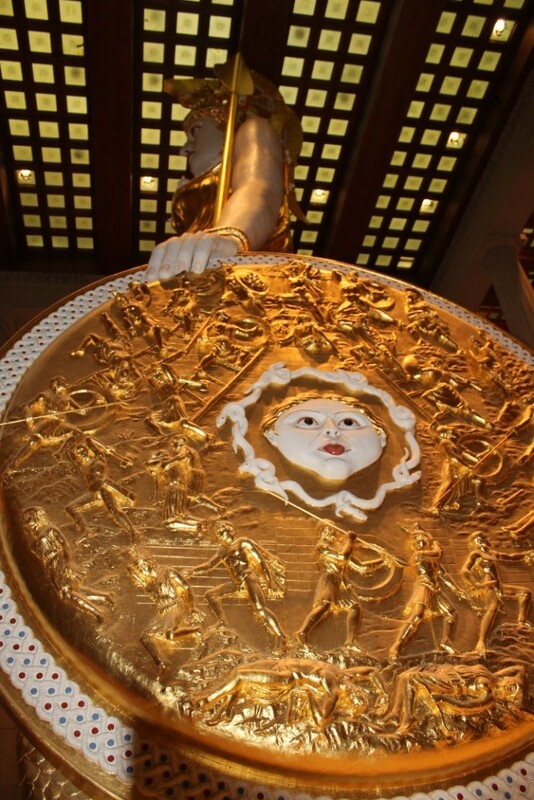 The building and the 42-foot tall statue of Athena inside are full scale replicas of the originals in ancient Greece. We were interested in both the building and the art collection inside. 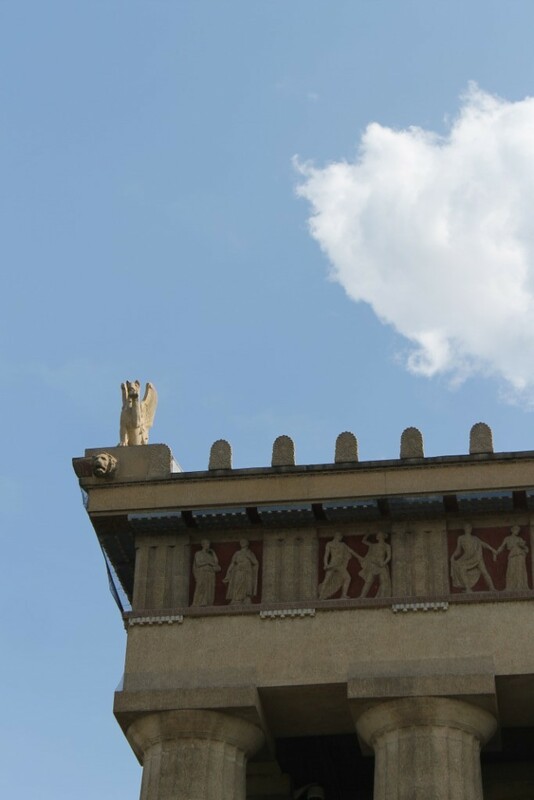 The Parthenon houses the City of Nashville’s art collection, which was donated to the city in 1927 by James M. Cowan, an art collector who had spent part of his childhood in Tennessee and considered it his ancestral home. No photography was allowed in the art gallery, but some pictures are available online. 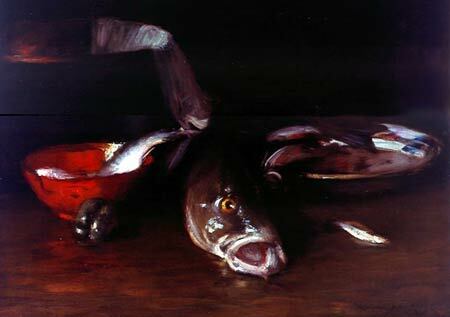 Here is a link to the Cowan Collection, with photographs of some of the paintings. I think my favorite was Widening Sea by Frederick Waugh – no picture, but this blog by Armand Cabrera has pictures of several of his works. Very turbulent seascape. That dead fish is even more dead in person. The art gallery visit was not enhanced by a screaming baby and a horde of college kids who were apparently there for a basketball tournament. Then again, when I was a college kid, I would not have been enthused about the art gallery either. Exterior of the building. 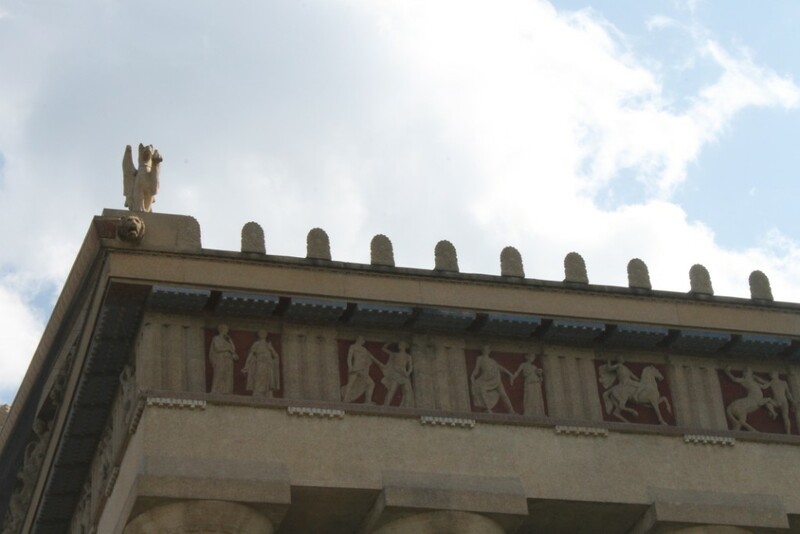 This one is all restored, the one in Greece has been damaged/looted over the ages and is missing most of the statues and friezes. Look at that blue sky, does it look like a tornado warning is headed our way? 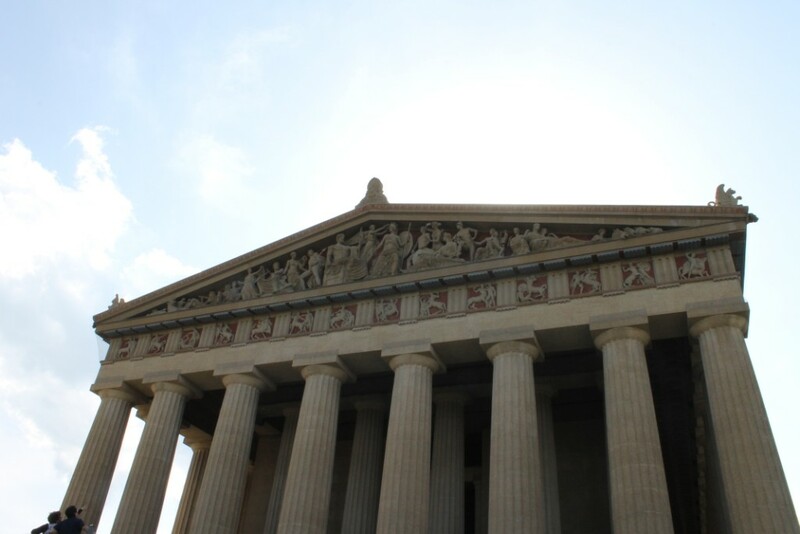 Once you are inside, there is a small admission fee, and then you can walk around the art gallery and displays of some of the history of the Nashville Parthenon, showing its history and how it was built, and re-built, and the renovations. 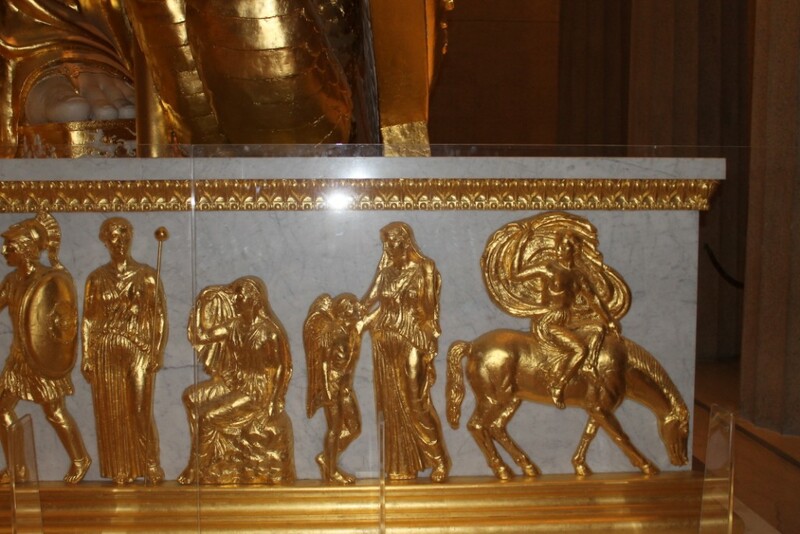 Upstairs you find the statue of Athena which was added to the Parthenon later, after funds were raised from private donations and school children collecting nickels and dimes. 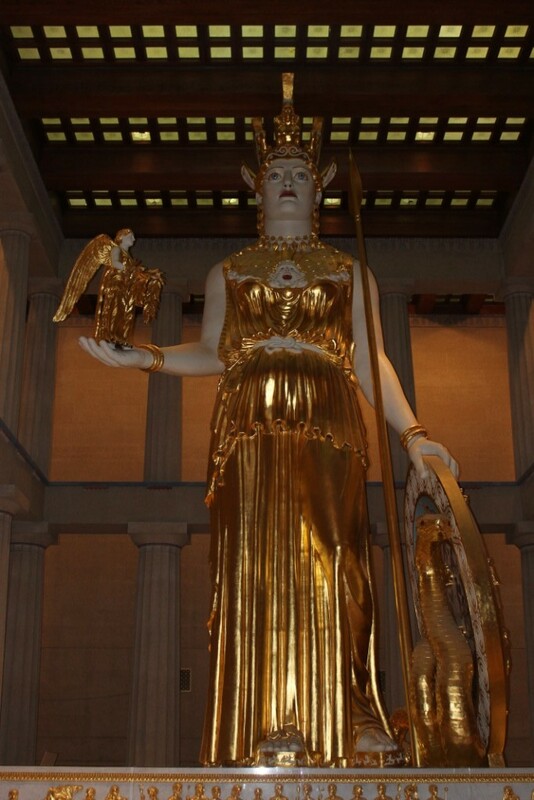 Athena is 41 feet 10 inches tall, making her the tallest piece of indoor sculpture in the Western World. Yes, she is rather frightening. This is the head of the medusa on her shield. This entry was posted in Art, Travel and tagged Nashville, travel by glenderella. Bookmark the permalink.